In our society, bullying is commonly seen as a normal, inescapable part of growing up that children and adolescents must simply endure. 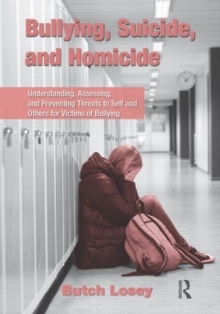 In Bullying, Suicide, and Homicide, Butch Losey challenges this viewpoint, arguing that bullying is not a part of childhood development, but rather an aberrant behavior that, for the victim, can lead to adverse decisions, such as suicide and homicide. 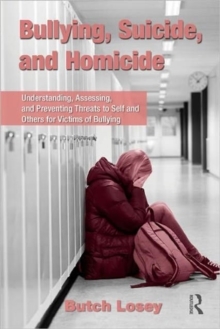 He provides a detailed understanding of the relationship between bullying, suicide, and homicide and an assessment and response strategy that can be utilized by mental health professionals who work with children and adolescents. 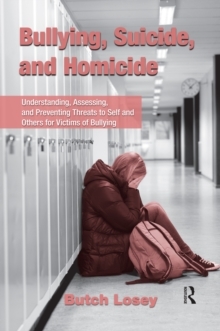 This strategy involves a three stage ecological approach: screening to identify warning signs for bullying, depression, suicide, and violence by means of the Bullying Lethality Identification System (BLIS), developed by Losey and a colleague; assessing the risks of suicide and threats of violence using specially tailored forms and tools; and mediating to identify appropriate interventions. All of the associated tools and forms that the author has created are included as appendices and on the accompanying CD. 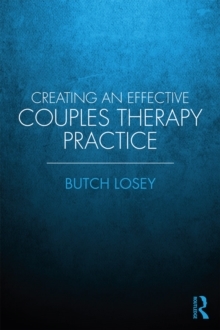 Losey's sensitive and compassionate treatment of this important subject will inform and motivate mental health professionals in their work with victims of bullying.